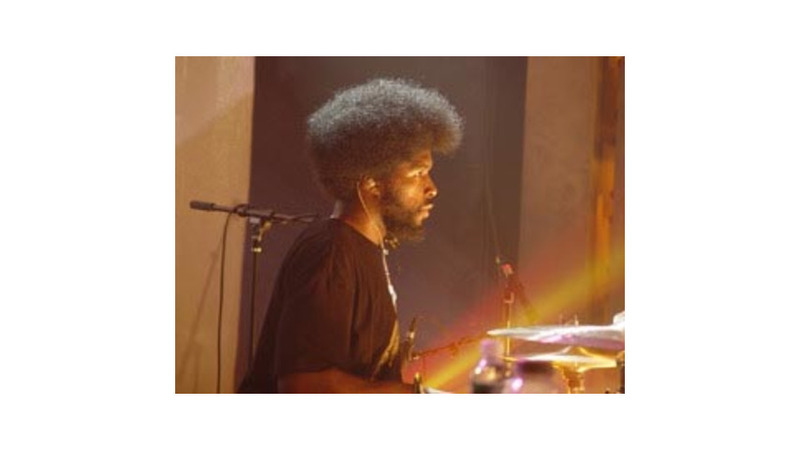 Given the legendary pomp, grandiosity, and catty exclusivity of many Grammy parties, The Roots’ now-annual low-key jam session is, in and of itself, welcome for the sheer thoughtfulness of its concept. Rather than merely provide yet another outlet for stars to see and be seen by one another, The Roots have crafted a night where most of the airtime goes to largely unknown groups who get a chance to strut their stuff in front of an appreciative quasi-industry audience. More about music than hors-d-oeuvres, it’s a refreshing antidote to tawdry Tinseltown tradition. As the line wrapped around the block to get into the Key Club—one of LA’s cozy-but-not-too-tiny, rising-star venues—all were awash in tremendous expectation. A quick word with ?uestlove before the show pretty much summed up the mood—“I just can’t wait to play, man” he said with a smile. And for their part, the Roots didn’t disappoint. Starting off the night’s jam session with a ripping set of funk flavors and an ad-hoc horn section, the night’s hosts seemed both relaxed and ambitious in their performance, working the crowd up to a boisterous lather. One got the sense that this was more or less what the group might sound like in a rehearsal space with the pressure off. Makes me wish I got invited to more of their rehearsals. The Roots, of course, have the chops to pull it off, which, unfortunately was not so much the case for many of their less-famous guests. In the parade of unsung groups that followed, ?uestlove’s continued presence on the stage more or less tripled the talent quotient, as various amateurs tried hard to strike a chord with the increasingly restless and gradually shrinking crowd. While you honestly wanted to like a lot of these groups for their obvious down-to-their-guts effort, in the end vocals came out flat, bass-lines flubbed and floundered, and the hook never quite came. I’d name names but in most cases I think they were forgotten before the set even ended, sadly. As such, by the time more-famous visitors like Musiq, Mos Def and Kurupt appeared hours later, the room had thinned and wearied. Two of the more interesting cameos were among the most surprising. With a little help from L.A. renaissance producer Jon Brion, Jamie Cullum popped up to goose the Fender Rhodes and squeeze out a delightful version of “Just Frontin’,” while Fiona Apple mesmerized with her gorgeous rendition of a song presumably from her now-in-seemingly-perpetual limbo, would-be upcoming album. To my ears, Apple’s delicate lament alone justified the long crawl into the evening’s fifth hour. Less galvanizing was Jada Pinkett Smith, whose supposed “guest host” duties seemed to consist of a shockingly lazy appearance at the very tail end of the performance, dressed in fresh-out-of-bed sweats to hop around to one song with nary a second on a microphone. Having been billed as so much more than such a blink-and-you’ll-miss-it-and-who-cares-if-you-even-notice 30 seconds onstage, her appearance was underwhelming, maybe even insulting. Although many of the stars that the invitation lead one to expect never showed, in a way that felt beside the point. Meandering, largely unscripted and hit-and-miss in its performances, The Root’s jam session was still a full night of varying and free-flowing music. A little extra quality control and a slightly shorter bill could ensure it remains a coveted invite for years to come.